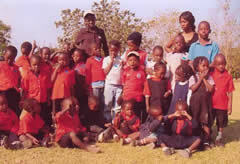 The AMSAI School in Lusaka , Zambia is a Preschool and a Kindergarten. It was started in the mid 70’s and has been functioning ever since. A major problem faced by the school was that as the years passed and the economy of Zambia worsened the school building became worse and almost collapsed. I remember a story when the economy of this country was in bloom; The Sectorial Secretary of Nairobi Sector suggested to Shrii P. R. Sarkar that the Sectorial Office should be moved from Nairobi to Lusaka . He then replied that nothing should be changed at the moment as the economy of Zambia will worsen in the future as Zambia was a land locked country and the future situation will be bad. Now is the time he was referring to. 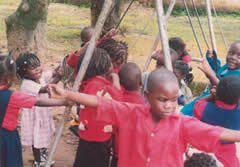 When I arrived in January in Lusaka the situation was very bad at our school and I was also surprised to see that no acaryas had been here for quite a long time. To my deeper surprise I found that 40 children were still at our school despite the bad situation, and that the school was open. We immediately started renovating the school building and within a month we had about 60 kids. 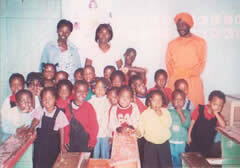 I also started a Circle of Love for Children which included simple meditation, asanas and Baba Nam Kevalam singing. The kids were simply ecstatic!I want to thank the two young teachers who have been struggling alone for many years and they are Cynthia and Rhoda. The second plan we had was to try and trace the former students of this school as it existed for many years. We managed to trace Natasha, who is working as an Immigration Officer working in the town of Chirundu bordering Zimbabwe . 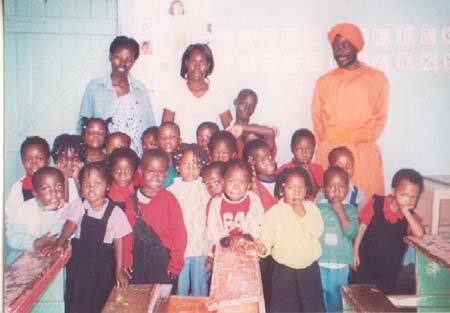 She practices yoga and is a vegetarian and thanks the Ananda Marga School for introducing her to her life style. 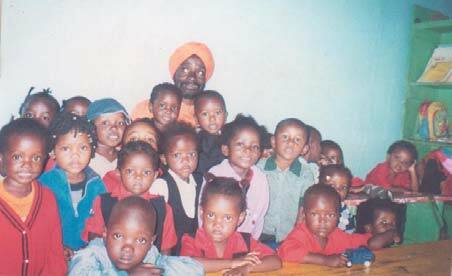 Then in April I decided to return to South East Asia to do some fund raising for the school and to ask for my transfer as no Acaryas were working in this part of Africa for many years. I just returned in the beginning of August and to my surprise the first thing the kids asked me was that they wanted Baba Nam Kevalam again as they had not been singing since the CD player that they were using had broken down and they were unable to repair it!